scarce, until now. A three-year field research study published in Scientific Reports Nature has provided groundbreaking data on the behavior, population connectivity and biophysical interactions of sailfish, a species that provides nutritional, economic and cultural benefits for artisanal fishing communities. Dr. Lutcavage and study co-authors Dr. Chi (Tim) Lam, assistant research professor, School for the Environment at University of Massachusetts Boston; Benjamin Galuardi, National Oceanic & Atmospheric Administration statistician; Emily Chandler, research scientist/program manager at Large Pelagics Research Center; and Captain Anthony Mendillo from Keen M. International Sportfishing deployed 34 popup satellite archival tags or PSATs (each valued at approximately $4,000) on sailfish off the coast of Isla Mujeres. The popup tags enabled the research team to construct way points for sailfish journeys, allowing them to begin to examine connectivity between sailfish fisheries hotspots. Sailfish were monitored for up to one year and displayed mostly shelf associated activity, occupancy of the Yucatán current near Isla Mujeres for up to five months, and then they dispersed from the Yucatán to prey-rich coastal areas in the Gulf of Mexico, the Caribbean Sea and along the South American coast. Tracking missions of sufficient duration revealed previously undetected connectivity between western Atlantic sailfish fisheries and pelagic longline catches. 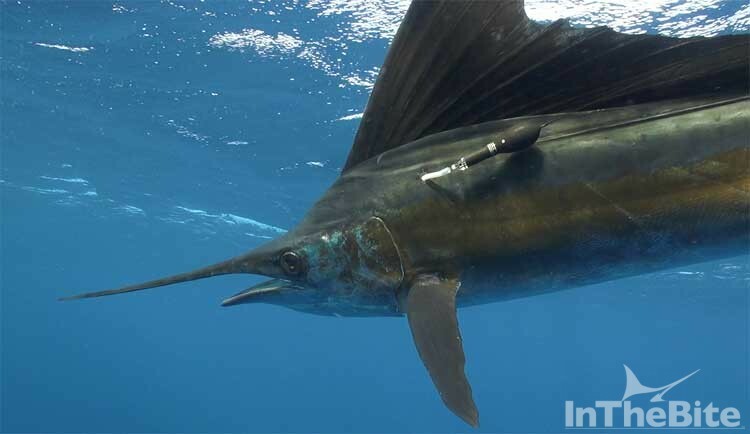 It also highlighted how fishery independent tagging can improve understanding of sailfish migrations and behavior for assessment and management. Sailfish are currently managed under the International Commission for the Conservation of Atlantic Tunas (ICCAT) and the stocks were assessed to be overfished in 2016, but huge uncertainties exist in the assessment process. In order to determine controls for catch levels and other management actions for sustainable fisheries, the LPRC team noted that comprehensive data collection is clearly needed. “So our work here is a step in the right direction,” Dr. Lam continues, “and would not have been possible without such a great team. The entire study can be viewed here: https://goo.gl/dX3mab and the scientific paper only here http://www.nature.com/articles/srep38163.